Patrick Chan performs his Long Program at the 2013 Canadian National Figure Skating Championships. Following a stellar pairs event at the 2013 Canadian Tire National Figure Skating Championships, the men had quite a job to do in their free skate. Overall, they were not quite as incredible as the pairs, but they did a fantastic job, raising the technical bar once again. Patrick Chan (CO) easily retained the Canadian title, albeit not in the roof-raising 300-point fashion that he did last year. Kevin Reynolds (BC/YT) and Andrei Rogozine (CO) maintained second and third place, respectively. After a gigantic opening quadruple toe loop-triple toe loop combination, Chan appeared to be well on his way to another perfect skate, but a few problems arose just after the midway point. He doubled his planned triple Axel and fell on his triple flip, meant to be his third combination. He scored 179.12 (85.04/95.08) points. Although the effort was not exactly what the 22-year-old had in mind, the quality of his skating was evident and he still won the free skate by a few points, and finished with 273.75 points overall. Reynolds had a fantastic free skate, nearly stealing the show from Chan with three quadruple jumps, a first for a Canadian skater, scoring 175.94 (97.60/78.34) points. The 22-year-old performed really well between the elements, much better than he has in the past. Taking on a lyrical free skate is a big challenge, and he rose to it. His total score was 261.26 points. After such a strong competition across both segments, Reynolds is looking forward to the Four Continents and World Championships where he hopes to replicate his success on the international stage. Rogozine won his first senior Canadian medal on Saturday after another technically phenomenal free skate. After opening with a huge triple Axel-triple toe loop combination, the 19-year-old was on fire, easily completing six more triples. He did leave some points on the table—his last two spins only earned level—but the consistency of his jumping was impressive, and he placed third in the long with 137.43 (72.01/65.42) points and overall (207.85). Elladj Baldé (QC) was fourth (204.44) for the second straight year after a fifth-place free skate (135.97). His hip-hop-inspired program got the crowd going through the step sequences, but he broke character between the big jumps, which was distracting to the overall effect. This problem was further complicated when the 22-year-old missed his second triple Axel and began to lose focus. Third after the short program, Liam Firus (BC/YT) was unable to maintain his position, but did enough to stay on the national team. 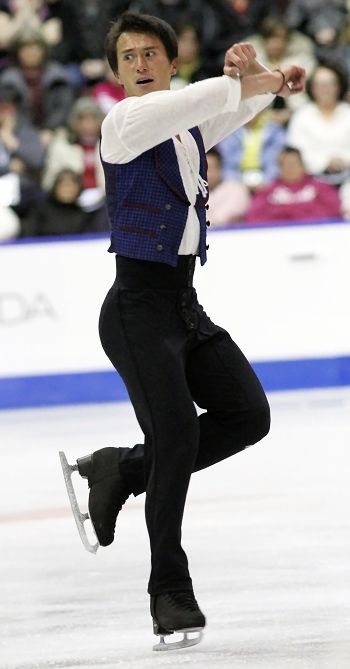 He finished fifth (202.41), although his free skate was ranked eighth. He was looking forward to a second successful triple Axel in this competition, but the 20-year-old two-footed the jump and it was underrotated. Mitchell Gordon (BC/YT) finished seventh, but gave one of the performances of the day. Unfortunately, he had to skate earlier in the day with the first two groups of skaters. His fourth-place free skate used a cheesy orchestral version of Neil Diamond songs, and after a terrific opening triple Axel and continued success on the rest of the jumps, the audience was softly singing along to Sweet Caroline. Gordon’s coach, Keegan Murphy, was even more elated than his student at the end of the program, giving a performance by the boards that put Brian Orser to shame.